Kenneth Kunce (Ken) passed away on March 7, 2019, at the age of 84. Ken was born on July 22, 1934, in Milligan, Nebraska to Robert and Josephine Kunce. When he was five years old, the family moved from Milligan to Wahoo, where graduated from Wahoo High. He graduated from high school at 16, lying about his age to be able to enroll in Creighton University. He was a respected student leader and served as president of the Student Board of Governors. He graduated from Creighton with a pharmacy degree in 1956. He worked his way through Creighton University with a number of various odd jobs; one of those various odd jobs was working at Smith Drug in Omaha, where he met and fell for a beautiful cashier, Cecelia (Ceil) Connolly. They were married at Holy Family Catholic Church in Council Bluffs, Iowa on July 14, 1956. Ken was then commissioned as a lieutenant into the Army where he served in Fort Leonard Wood, Missouri, where his first son, Kenneth Jr. was born. He was honorably discharged and joined the reserves. The young family returned to Council Bluffs, where Ken worked as a pharmacist for Connolly Drug and then Hushaw Drugs. Daughter Julie was born in Council Bluffs. Ken was called to serve his country again in 1962 with the Berlin Wall crisis, and the family was stationed at Cheyenne Mountain at Fort Carson in Colorado Springs, Colorado, where daughter Amy was born. Following his second honorable discharge as a captain, the family moved to Norfolk, Nebraska and Ames, Iowa while Ken and Cecelia searched for a pharmacy to purchase. Ken found a small town pharmacy in Onawa, Iowa and the family moved there in 1964. In Onawa, Ken and Cecelia operated Onawa Rexall Drug and were very involved in the local parish and community. The two younger children were born in Onawa, Jon in 1965 and Mary Ellen in 1968. Ken was a community leader in the Knights of Columbus, the Chamber of Commerce, and the City Council. He helped to lead an initiative to renovate the downtown and, later, to secure funding to build a new high school. Ken sold Onawa Rexall Drug in 1973 and briefly considered other career options, but eventually returned to the pharmacy. He bought three pharmacies in Beatrice, Nebraska, and commuted to his family on the weekends in his little orange VW. After selling the Beatrice pharmacies, he and Cecelia found the perfect business opportunity and town for their family in 1976 – Shestak Drug in Falls City, Nebraska. In Falls City, Ken brought his good humor to the community and soon became a business and community leader in town and at Sts. Peter and Paul Catholic Church. Ken changed the name of the pharmacy to Ken’s Pharmacy. Eventually, he and Ceil had a JC Penney Catalog store and a Radio Shack as part of the pharmacy. The soda fountain was the town’s gathering place to have a cup of coffee and a piece of homemade pie for a quarter and to catch up on all the news of the community. Among other things, Ken led the charge to eliminate paid parking downtown to encourage shopping, he had Falls City declared the balloon capital of Nebraska and staged hot air balloon launches and events, and he created a Falls City “ground dog day” celebration on February 2 to compete with Punxsatawny Phil. He promoted and built up Cobblestone Days into a regional “must do” event, and was honored as the Grand Marshal of the parade in 2014. Ken was a leader in the Chamber of Commerce and an active member of the Elks Club and the Knights of Columbus. He was named as an Admiral in the Great State of Nebraska Navy. He was a hands-on leader, who recruited doctors, helped to promote and improve the hospital, and innovated services including the HandiVan and Meals on Wheels. He hand-built the retaining wall at Sts. Peter and Paul Church. He didn’t rest in his retirement – during that time he envisioned a beautiful new library and cultural center. He led the fundraising efforts to build the Falls City Library and Arts Center, which perfectly matched his ideal of a regional gathering place for education and art. Ken loved his community of Falls City and all the people he was privileged to interact with and serve every day. Ken’s accomplishments in Falls City are too numerous to mention, and he brought light and laughter to every task. He loved people – he knew everyone who came to Ken’s Pharmacy and always had a joke to share. 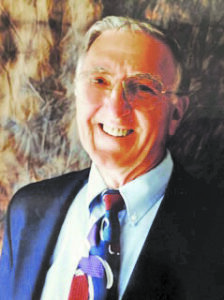 He was the President of the Nebraska Pharmaceutical Association and received numerous state and national awards for his leadership and innovation in the field of pharmacy including being named as the National Retail Pharmacist of the Year and later being recognized with the prestigious Bowl of Hygeia Award from the American Pharmacists Association in 2007. He retired from Ken’s Pharmacy in 1998, but couldn’t stay retired. He unretired and started Falls City Pharmacy in 2004. He retired again in 2008 and, finally, he and Cecelia were able to spend more relaxed time with his adult children and grandchildren and taking care of his large, beautiful yard. Ken simply loved life and was curious about every person he met. He never met a stranger and would strike up conversations with anyone and everyone he encountered all over the world. He, Cecelia, and the kids loved to travel. During the hot Iowa and Nebraska summers, they took road trips filled with family sing-alongs led by Ken’s deep baritone and endless shaggy dog stories that started in one state and often didn’t end until the car had crossed the into the neighboring one. Those trips were first in the car then, later, “camping” in the Winnebago. The family traveled to nearly every state and into Canada over the years. After each retirement, Ken and Ceil literally traveled the world, by driving through the US (including Alaska), and extensively touring Italy, France, Ireland, and Czechoslovakia, among other places. They would get in the car or jump on a plane and just go whenever and wherever the mood took them. Ken was a lifelong, devout Catholic who ushered and served at daily Mass. More than anything else, though, Ken loved his family. He took great joy in his bride of almost 63 years, his five children, and his five grandchildren. He will be missed by each of them, and by so many in each of the communities that he touched. Falls City and this world are richer because Ken Kunce brought his own brand of laughter and joy to it. He will be missed by many and remembered always. He is survived by his wife Cecelia and children Julie Kunce Field and her husband Stuart Field of Fort Collins, Colorado; Amy Kunce of Lincoln; Jon Kunce and his wife Kathy Radosta of Bellevue; and Mary Kunce and her husband Rick Johnson of Seattle, Washington, as well as grandchildren Sam and Ellen Field of Fort Collins, and Conor, Evan, and Aaron Johnson of Seattle. He was predeceased by his son Kenneth J. Kunce, Jr., and his brothers William and James Kunce. Ken’s family invites the community to celebrate Ken’s memory at a memorial mass at Sts. Peter and Paul Catholic Church, Falls City, Nebraska at 11:00 a.m. on Saturday, April 27, 2019. Visitation will be held at Dorr and Clark Funeral Home, Friday, April 26, 2019, from 5:00 p.m. to 7:00 p.m., with a rosary at 7:00 p.m.